The George Fox football team took a significant step forward in 2017, earning a top-25 ranking for the first time and moving up from third place in the Northwest Conference in 2016 to a tie for second. The Bruins also boasted 11 players on the All-NWC football teams a year ago, but easily surpassed that with 17 honorees this fall. Leading the way was linebacker Charles Riga, who was named co-defensive player of the year after leading the conference with 121 tackles. The senior, who also earned first-team honors in 2016, was third in the NWC in both sacks (seven) and tackles for a loss (13). 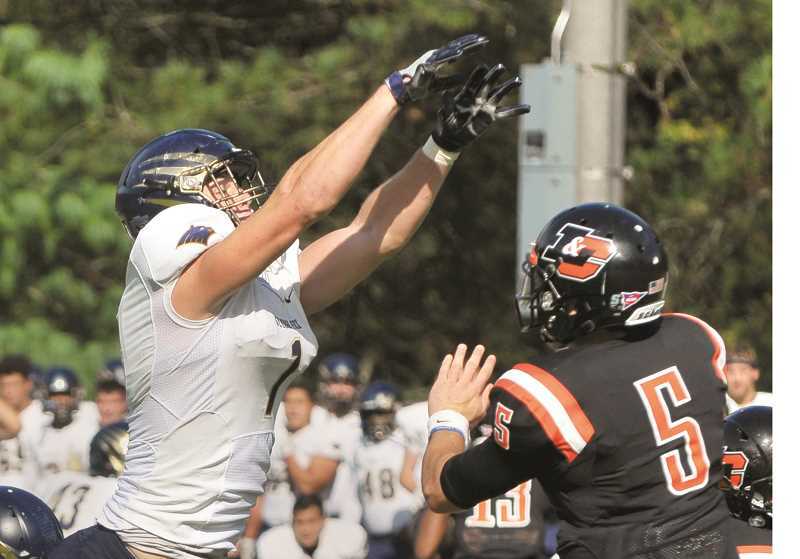 After three seasons, Riga holds the record at GFU with 293 career tackles. Also making the All-NWC first team were offensive linemen Nolan Schuler and Nathan Corliss and defensive linemen Caleb Dalzell and Justin Kruse. A senior, Schuler was named All-NWC for the third time in his career and first-team for the second consecutive year. Corliss, a junior, was a second-team honoree last year. Dalzell, a junior defensive end, was also named to the first-team for the second consecutive year after finishing first in the Northwest Conference with 17 tackles for loss and second with 9.5 sacks. In George Fox's 12-6 loss at No. 7 Linfield Nov. 21, Dalzell set a NCAA Division III single-game record with 7.5 tackles for loss. Kruse, who earned named honorable mention honors in 2016, made the first team as a senior after posting 10 tackles for loss and 5.5 sacks. Led by four-year starting quarterback Grant Schroeder, the Bruins landed six players on the All-NWC second team. An honorable mention pick in 2016, Schroeder finished second in the league in efficiency (134.2), third in yards (1,772) and fifth in yards per game (177.2). With a career stat line of 7,015 yards, 55 touchdowns, a 53.6 completion percentage and 122.3 efficiency rating, Schroeder owns every passing record in GFU history. Senior wide receiver Brad Lander, who was on the other end of many of Schroeder's passes, was also named to the second team after racking up 540 receiving yards and seven touchdowns this fall. For his career, Lander caught 140 passes for 2,158 yards and 14 touchdowns. Sophomore Anthony Garcia was named to the second team as a kick returner and honorable mention as a running back, becoming the first Bruin to make the team twice. Garcia was second among returners in the NWC with 501 return yards and carried the ball 67 times for 332 yards and three touchdowns. Senior Dane Jensen, a Newberg native, also earned second-team honors along the defensive line after 34 tackles, two sacks and 5.5 tackles for loss. Rounding out the contingent of second team honorees were sophomore linebacker Daniel Campos and senior defensive back Ryan Russo. Campso was third in the league with 76 tackles, while Russo tied for third with 13 pass breakups. Also earning recognition from the league as honorable mention performers were running back Wesley Riddell, wide receiver Lane Hadley, offensive lineman Chase Hudson, as well as defensive backs Caleb Harrell and Rudy Hughes. Senior linebacker Trent Hardin was given the All-Northwest Conference Sportsmanship Award for his character on and off the field.